After three busy port days, it was nice to have a day at sea to relax a bit. They have picked this day as the day of Celebration onboard to celebrate special occasions during the voyage like a birthday or anniversary. We are going to celebrate our 21st anniversary, which is May 2. There is free wine at dinner to help us celebrate. Barbara, our travel guide, spoke about things to see and do in our upcoming port of Walvis Bay, Namibia. George Sranko lectured on the great white sharks that call this coast home. Most every beach in South Africa uses shark nets to keep the sharks away from people enjoying the water. These carnivore sharks can be over twenty feet in length and weigh several tons. Unfortunately, with the demand for shark fin soup, hunters are killing the sharks more rapidly than they can reproduce. The great white shark has an eleven-month gestation period with more than one fetus but the strongest fetus will eat the others until there is only one left in the womb. This is a unique fact that I had never heard of before. They had another fundraiser for the Bernard Noordkamp Center in Namibia today. Many of the folks who have been taking watercolor classes on all of the sea days during the voyage donated works of art to be auctioned off in a silent auction. Some of the paintings were quite nice, so I am sure that they will add more money to the $1,227 that was raised at the dunk tank event a few days ago. We took in the movie this afternoon, which was: “Hyde Park on Hudson” about the love affair between Franklin D. Roosevelt and his distant cousin Margaret “Daisy” Suckley. It centered on the weekend in 1939 when the King and Queen of the United Kingdom visited upstate New York. It was an interesting story about the times—romantic and sad at the same time. Our tablemates were having dinner with the captain so Kent invited one of our lady friends, Kathy, to join us at our table. She had already eaten at the early seating but they were serving free wine with dinner and that was of interest to her….why eat when you can drink! It was a formal dinner and the dining room was completely decorated in gold, red, green and yellow fabric and streamers. Each table had primary colored Mylar balloons and there was a colorful horn and top hat placed at each seat. All of these decorations were for the Celebrations theme of the day. Not two minutes after we started eating, Cathy announced she was not wearing underpants. Why we needed to know this I am not sure ,but Kent got quite a kick out of it and needed an explanation. Of course, prim and proper as I am, I was scandalized and had to stop eating my garlicy escargot. The explanation can’t be printed. Kathy is on her 75 cruise and is a hoot. She knows where to get all the free drinks…..hates to pay for it. She had 3 glasses of wine with us while we ate and behaved pretty well…only blew her celebration horn (like you use at New Year’s Eve) twenty times. Kent gets along with her very well, as they both have the same sense of humor and behavior…..OMG! 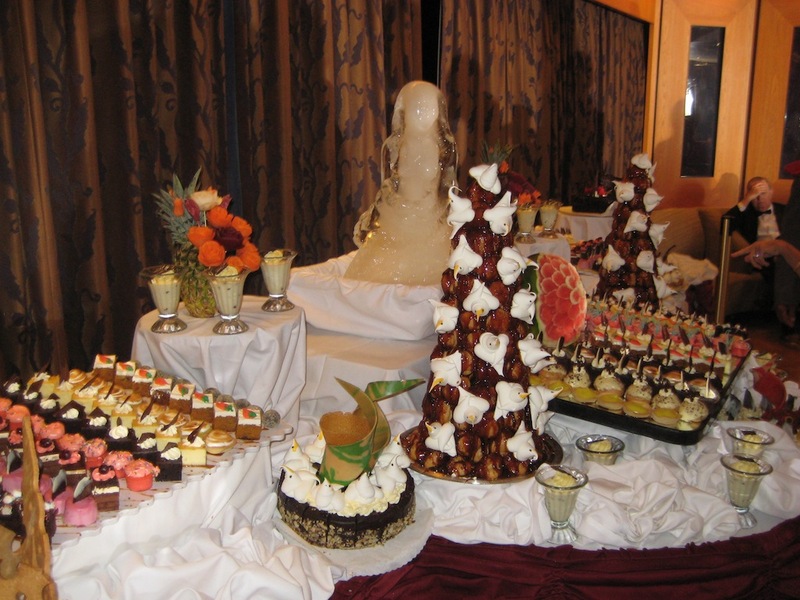 After dinner they had a dessert extravaganza on three levels of the main atrium of the ship. 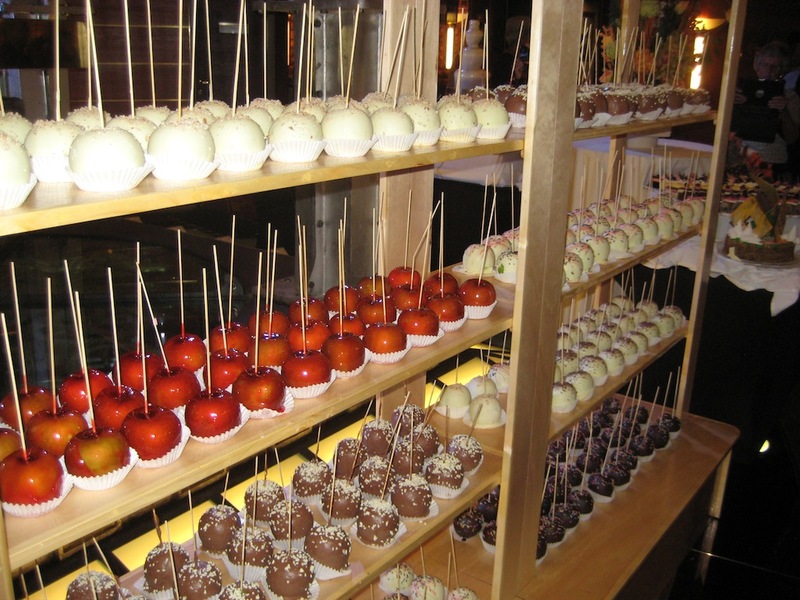 The chefs had created a delectable concoction of delicious candy apples and desserts from the classic to the unusual. They were all beautifully displayed for folks to take pictures of before they served them up for guest to enjoy. Oh, if Kent could only be happy with a dessert picture…instead of eating them! The entertainment this evening was a strings group called the Soweto Strings. They were four South African men who played two violins, the viola and cello. They wore zebra printed jackets, black slacks and white shirts. They were very accomplished musicians but all of their songs sounded very similar.